2015-05-18 by @edent | #google | 12 comments | Read ~59,850 times. I actively resent having a Google+ account. It's a bloated desert of half-finished ideas. Even the Google employees I know seem to have stopped using it. It's a necessary evil when dealing with Google products, sadly. I haven't used it in months and my profile tells people not to contact me there. That doesn't stop all manner of spammers from adding me to their "circles" - which, in turn, causes an obnoxious little notification bubble. Ok, so if you have to have a G+ account (for YouTube, location services, or other reasons) - here's how you can make it totally private! No one will be able to add you, send you spammy links, or otherwise annoy you. You can then set a "custom audience" - usually you would use this to restrict your account to people from a specific geographic location, or within a specific age range. In this case, we're going to choose a custom audience of "No-one". Check the box and hit save. 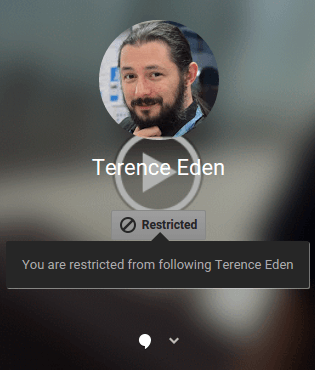 Now, when people try to visit your Google+ profile - they'll see this "restricted" message. You can visit my G+ Profile if you want to see this working. NB - content you've previously posted publicly may still be visible. Dear Google - you "sunsetted" Reader, Latitude, Code, and Glass - it's now time to do the decent thing and put G+ out of its misery. Life-saver, thank you very much. Exactly what I intended to do, instead of deleting every damn one of my posts. I use my google account for a few programs and apps that require it and was disappointed when I went to my google account page and found it had been viewed over 14,000 times. To my knowledge I don't really have any information available on it but it creeps me out that anyone could look it up and potentially find all of the information google has on all of us. Thank you for your quick and simple fix. 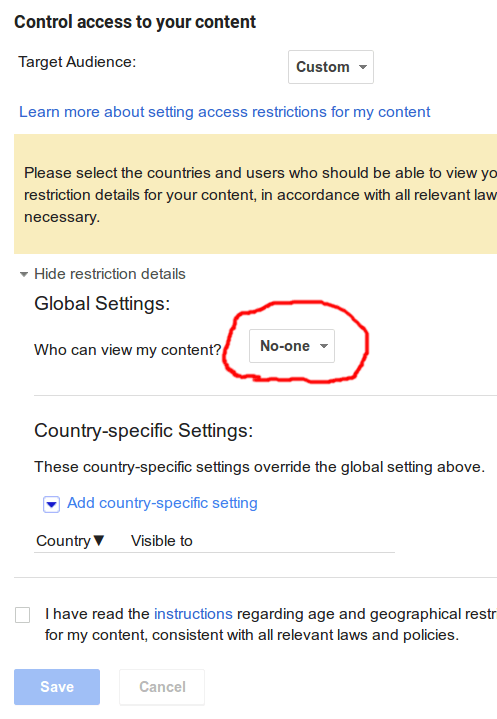 I cannot seem to find this option, did Google change it? I followed the steps in the Audience section, plus unchecking a whole bunch of other options elsewhere for sharing things, but when I view my profile as "Public," I don't seem to be able to see a "Restricted" label on my account, and I think people are still able to add me to their Circles. Know of any other settings to take care of these? I looked all around, even deleted and recreated the account. Try logging out. I think you see those things if you're still logged in. Sadly, that's all the help I can provide. I suggest you contact Google for further information. Thanks. I couldn't find that on my own. Got the same problem. People can still see my profile. It didn't change anything actually. What does your account look like when you log out? For those of you who can't find the setting, clicking on the link just brings up the settings page. If this happens look under general and click where it says to switch view to classic G+. That should open another tab. Click on the audience tab at the top.